With all the trendy breakfast spots popping up in the Metro, picking between different options possible can be a little frustrating. Fortunately enough, I’ve got myself a go-to restaurant for those “I’m too hungry to think” moments: Pancake House. Jumping on the Salted Caramel craze! Newest on the Pancake House menu is a modern take on the classic stack of pancakes. Salted Caramel cascades down the pancakes forming a lake on the plate. Bits of walnut streusel surround the stack of golden pancakes, almost caging the moat of caramel. 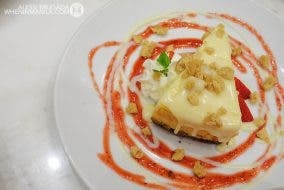 And to top the dish off, a signature scoop of Pancake House‘s cream rests on the topmost layer. A commendable note about this dish is the buttery caramel used. The butter helps in mellowing out the harsh tones that most syrups tend to have. It also makes everything less sticky and more palatable to the taste. Don’t forget to order the Salted Caramel with Walnut Pancakes with a side of Country Sausages. The latter’s saltiness complements the sweetness of the caramel, bringing in a delectable savory element to the dish. Bangus Belly is a staple in every Filipino household. Love it or hate it, it’s been served on the table at least once. Pancake House’s Home-Style Bangus plays on the simplicity of the seafood by soaking the milkfish in a flavorful marinade. This marinade seeps into each of the fish’s flakes, making every bite an enjoyable experience. The fish is served with rice mixed in with some toasted garlic chips, a sunny side up egg, and a side of mango salsa. This dish was so well received by our table that everyone picked it as their favorite. Upon further explanation by the area manager who assisted us during our visit, we found out that Pancake House even exports their Bangus to Malaysia. Guess our humble Filipino milkfish has gained international fame as well. Spaghetti with Meat Sauce, a dish famous enough to impress the Pepper.PH foodies. Another Pancake House favorite is the Spaghetti with Meat Sauce. 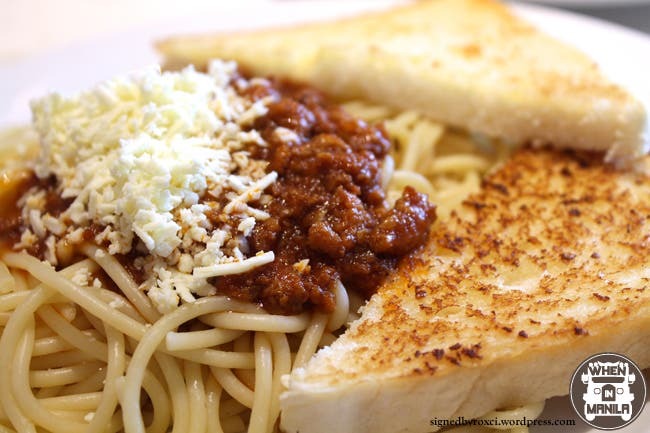 Cheese is generously grated over the meaty sauce, completing the home-style spaghetti that many Filipinos know and love. The restaurant’s take on the sweet spaghetti has garnered so much attention that even Pepper.ph made a food hack attempting to copy the recipe. Pancake House has even made a take out pack for all those who just can’t get enough of their sauce. Beef Tapa made even better with Mango Salsa. It’s hard to go wrong with a Tapsilog dish seeing as its comprised of only three things: tapa, sinangag rice, and an egg. 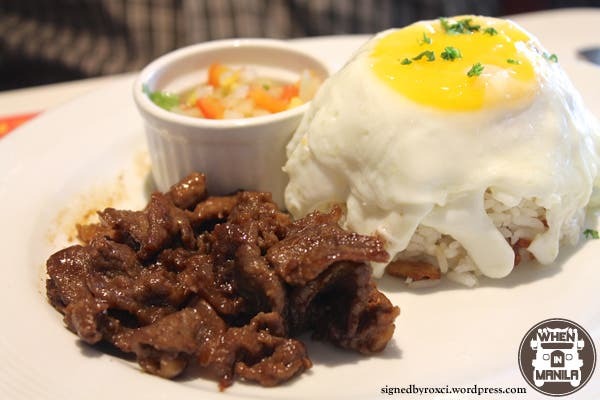 Pancake House however, goes the extra mile and elevates their Beef Tapa to a whole new level with their choice of marinade and side of mango salsa. The beef bits are coated in a sweet and savory glaze, and are totally devoid of annoying strings of meat. I prodded a bit further with the side salsa and found that the restaurant switched its serving of atchara in favor of the sweet mango salsa. A note worthy feat – if I may so myself – since the mango salsa enhanced the many flavors of the dish. This Restaurant in Makati is Every Meat Lover’s Paradise!